​You might discover one that is like you! When Jesus ascended on high He gave gifts to men and one of those gifts was that of a prophet. The primary purpose of a New Testament Prophet is to impart of love for God's presence and impart a desire and equip others to hear God's voice. 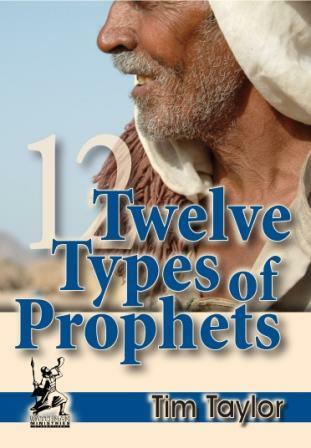 In this lesson you will learn about the 12 different kinds of prophets, the prophetic anointing and how God anoints people. You will learn about the wide variety of ways God communicates and about prophets who are dreamers and visionaries, those who declare God's corporate purpose, those who proclaim God's heart standard, those who declare the church's social responsibility, and the prophets who declare God's administrative strategy. You will also learn about prophetic worship leaders, intercessors, counselors, equippers, evangelists and writers. It is Tim's sincerest desire that you will discover more about how the prophetic gift works in your own life. This message is from a "Seer Class" taught by Tim and two other prophets at Sonrise Chapel. Graham Cooke's book "Developing Your Prophetic Gifting" was required reading for that class. Chapter 2 provided the context for what was presented. Difference between the seer and nabi prophet. Moses was presented as a nabi prophet yet also functions as a seer. Actually a combination of both. Jeremiah 1:5-12 - ordained a prophet to the nations from the womb. Pattern, see the form, perceive it is God, then God speaks. Exciting, fun, awesome and sometimes painful, weighty and challenging.